I’m on vacation! While I’m going away later this week, it was the first weekday for me to really enjoy in ages. I got up, made my son breakfast (Enviro Kids and Puffin cereals are our faves), and lunch, hit the gym, and grabbed my usual venti decaf with soy from Starbucks for the drive home. Then, after a simple vegan lunch (I just love beans…) I did something I almost never do ~ I sat on the couch in my living room and watched tv, uninterrupted for an hour! No email, no phone, no work…just me and channel 29, the Food Network. The first episode was with Paula Deen. God bless that woman! I think she keeps the dairy farmers in business! Though I’m not sure she’s ever made a dish I could eat or would replicate, she really is entertaining. Next, bring 1 cup of vegetable broth with 2 tsp of cumin to a boil and add 3/4 cup of couscous. mix well, turn off the heat, cover and let sit for about 5 minutes. Fluff with a fork when done. 2-3 TBSP of olive oil, and salt and pepper to taste. You might want to also add a 1/2 cup of your favorite non-dairy cheese. 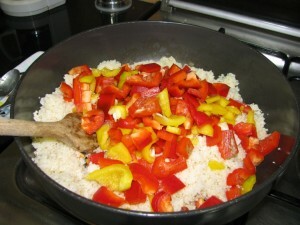 Once gently mixed, add the couscous and gently mix again. 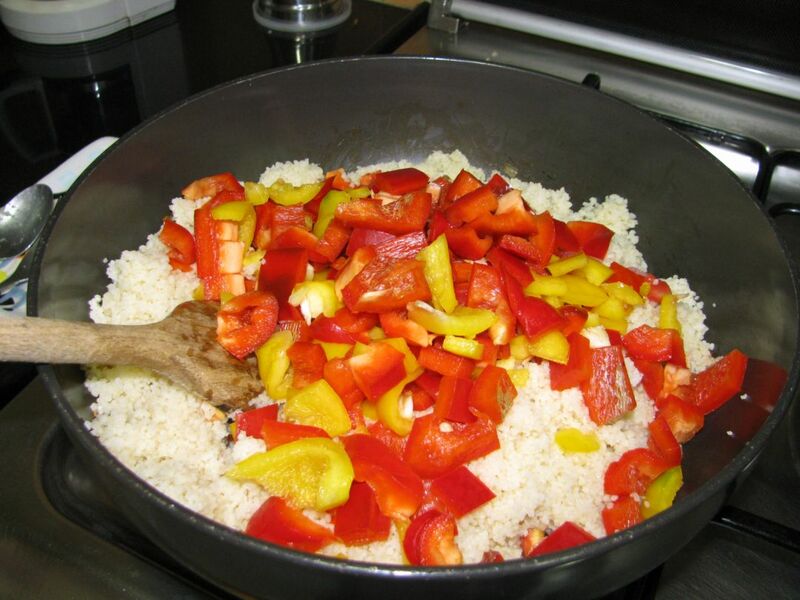 Fill each peppers with 1/4 of the couscous mixture and drizzle a little olive oil over the top. Pour 1/2 cup of water in the bottom of the tray and bake at 400 degrees for an hour. While they cook, put 1 clove of garlic, 2 tsp of lemon juice (or juice from 1/2 a lemon), 1 cup of fresh basil, 1/2 cup of non-dairy sour cream, 1 TBSP of water, 2 TBSP of olive oil, 1/4 tsp of sugar and salt and pepper to taste in a blender and puree in a blender until smooth. 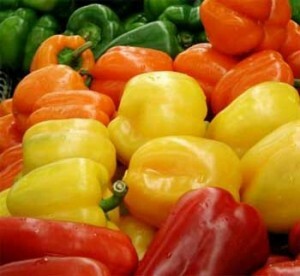 Drizzle the sauce over the top of each pepper once you remove them from the oven and serve. For dessert, Giada made brownies with an ice cream layer topped with chocolate ganache ~ it sounded scrumptious but was made with eggs and dairy. 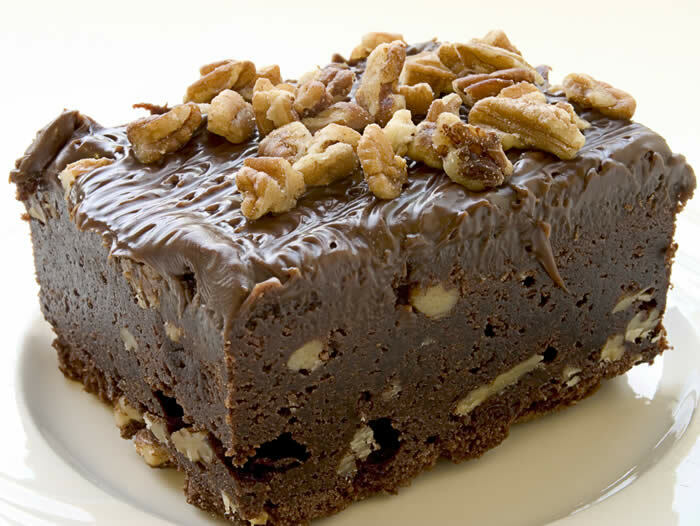 For a similar but vegan version, bake up some egg-less brownies (or pick some up at Whole Foods or another local vegan market.) Top them with a non-dairy frozen dessert by Almond Dream or So Delicious, and sprinkle it with semi-sweet chips…how bad could that be? Veggies, grains, protein…and a sweet treet ~ sounds like a perfect meal!